Dawn is a variant I made up of the Japanese folktale "The Crane Wife" (available in the U.S. in a translation by Katherine Patterson). This is a story as familiar to Japanese children as "Little Red Riding Hood" or the "Three Little Pigs" is to American children. I think it is one of the most beautiful folktales I have ever read. Most folktales Americans have chosen to keep in our "tradition" have happy endings. Americans like to pass on the message that life can be happy and that we can solve our problems, no matter how apparently overwhelming they are. Japan, like all nations around the world, has many tales with happy endings as well, but they also have other stories. Some of the themes that run through many of their folktales are: the transience of life, the imperfections of humans, the inability to be aware of how much we love, the loss of the people we most love, and perhaps most important, the necessity of repaying a kindness or a debt, even at the cost of one's own life. "The Crane Wife," and therefore Dawn, contains all these themes. I first read and heard about the story when I lived in Japan from 1965-67, and I was intrigued, even enchanted by it then. I didn't know what to do with it until many years later, after I had illustrated several books and was familiar with the structures or patterns of folktales and was more able to play with those structures. But I noticed that these very small changes had changed story a great deal. It had become much more of a Greek tragedy than the original. In a Greek tragedy, the hero or heroine continues to pursue the path that he or she believes to be right, and that Fate has intended them to pursue. But the more they go forward along that path, the closer it leads them to uncovering a secret from their past that will eventually destroy them and those who love them. In Dawn, the father becomes filled with the drive—almost the Need or Addiction—to make a boat that will be so fast it can "almost fly." In other words, he is unwittingly trying to become like the true form of his wife—a Canada goose. But the more he is driven to become like her, the more he is also draining her of life, until he almost kills her—and uncovers the secret that she had kept from him. I think this story also shows how important truth is to a marriage. The wife had to keep her true nature a secret from her husband, and this falsehood, or secret, was a basic faultline in their marriage that would eventually crack open. One could suggest that she just say at the beginning, "Dear, I need to tell you something. I'm actually a Canada goose—the one you saved when I got shot." But if the husband has happily accepted this rather difficult fact about his wife, as we need to accept difficult facts about our mates in a real-life marriage, there would have been no story. 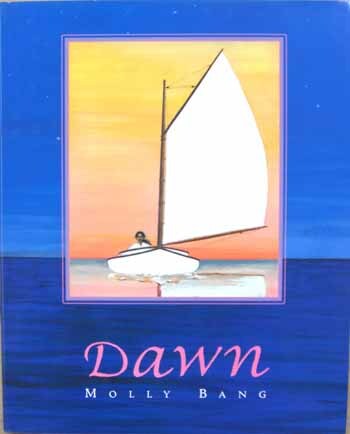 Many people have suggested I make a sequel to Dawn, so we can find out what happens—to Dawn, her mother, her father. I have tried many, many times. I originally thought of Dawn as the first in a series of stories that would take place on the east coast of the United States, around the 1860's when our schooners were "our cathedrals", as the historian Samuel Eliot Morrison has called them, "but cathedrals made of ice"—because of their cargo and because they lasted for so short a time, only about 50 or 75 years. But every time I sent a story to the editor, he would say, "Molly, Dawn is a pearl, a jewel, and these are only rocks. I will wait for another pearl." Unfortunately, I agree with him, and I am also still waiting.